This past summer I decided to start composting. This was not easy because I was living with another family so that I could work at a summer internship in another state. I had to convince the family I was living with to have a bucket of stinky food underneath their sink and a barrel of stinky food with flies in it in their back yard. I did have my best friend who is their daughter helping me though. Before digging into how I convinced them to start composting, I want to give a quick blurb on why composting is important. By composting, I was finally doing something and working toward something to keep creation healthier. One simple habit made me think about everything else did. I now thought about how the products I bought affected creation. It drove me crazy to see cans and bottles thrown in the trash when they should be recycled. Making one small daily choice made me rethink a lot of my choices in terms of caring for the environment. So how did I get people whom I was essentially a guest to compost? 1st I made it super easy for the family I was living with. I made the barrel that the compost was put into outside. I made the bucket to throw the compost in underneath the sink. I regularly brought out the bucket to the outside. All they had to do was make it a habit to throw compostable things in the bucket instead of the trash. 2nd My best friend and I constantly reminded those we lived with to throw things that were compostable in the bucket underneath the sink until it was a habit. We knew we had achieved this when one time when I was cleaning out the bucket that went underneath the sink, multiple people asked me where it was as they were trying to throw things away in there. It even became awkward for people to throw things anywhere but in the compost bucket. 3rd I did my best to stay the course when composting wasn’t as exciting. Whenever you start something, it is always exciting, but then the excitement wears off. It then gets sickening to have to take out stinky food. Then you think about how the difference you are making is just a small one. This is when you have to just stay the course. So if you live with people who may not be excited about composting, it is easier than you think to get them to start composting with you. Just set up the system for composting, encourage them, and stay the course. Guest Post Author Bio: Lee Veldkamp is a 22 year blogger who is geeky about financial decisions. He is on a mission to inspire people to break the chains that are holding them back from freedom and he shares his own experiences and others on his website www.thevaluegeek.com. I’m a composter – I started earlier this summer. I know what you mean about the flies – a tight fitting lid sorts the fly problem out though. 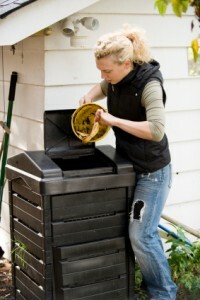 Great subject for a blog – everyone should compost ! Had a nice and tight lid, but it would be an explosion every time it was opened to add more compost. Kind of fun, but kind of gross. I want to compost more, I live in a hot country so it is complicated, we have wild animals and it smells a lot, but with a proper container it should be great for the garden. I just heard a story from a friend who was composting and had a raccoon proof lid. Well, it didn’t turn out to be that way. In fact, his neighbor saw the raccoon with open up this complicated lid while its babies were watching. The raccoon then proceeded to have teach each of its babies to open it up. If the baby could figure it out, the mom would get back on the lid and show the babies how to open it until each baby could open it by themselves. Crazy story. Great post ! I am happy that you took such a good step to start composting and made people around you to do so. Yes we have reached a stage where we need to take care of our eco and this is really a good way to start off. I really want to start composting once we move. I have thought about it a million times but have never gotten started. It’s on the list! I hope this post was another good reminder of what you want to do. We compost and have a container with lid that we keep on the kitchen counter next to the sink. The biggest hassle with composting is aerating the pile. My wife was OK with doing this when she started us on the road to composting several years ago. It is now my job to aerate the pile. Lucky me. You should look into those spinning bins. I heard they work pretty good and make it easy to move and aerate. They aren’t too pricey either. I always tell negative people to never ever discourage anyone who makes any progress no matter how small or insignificant you think it is. I admire you for the cause you pursue! I hope more and more people come on board on this. That is a great motto Marissa. We shouldn’t be negative on others efforts. We should applaud them. We’ve been composting for 5 years now my brother made a big hole in our backyard and we put our garbage in there. Effectively it improves the quality of the soil that we use for our plants and gardens.